Published on February 3, 2016 by Martyn. Be the first to comment! February 4th, 2016 . . . publication day! 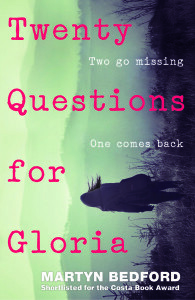 Twenty Questions for Gloria, my third novel for teenagers and young adults, is officially published in the UK by the brilliant team at Walker Books. Even though this is my eighth book altogether – and it’s just one month short of 20 years since my first adult novel came out – the thrill of seeing a new one hit the bookshops (virtual or otherwise) never dims. Here’s a link to Walker’s Ink Slingers site, where you can read an exclusive extract from the novel. “Uman didn’t make me do what I did. He made me realise I wanted to do it,” explains Gloria, the narrator of this absorbing psychological thriller, but both her parents and the police find this impossible to believe. After vanishing for fifteen days, Gloria is being questioned as to why she went on the run with a boy she’d only recently met. But it makes sense to Gloria. Enigmatic Uman does things his own way, never “giving a damn what anyone thought of him”. While initially sceptical of his claim to be able to “read” people, Gloria can’t deny it when Uman says he knows that her “life disappoints her”, a truth no one else has noticed. And so their relationship shifts from “impending” to “embryonic”, to use Uman’s inimitable turn of phrase, and they run away, the course of their journey determined by a pack of cards. Thriller fans will be as enthralled by this book as Gloria is by Uman’s free-spiritedness. It’s exquisitely plotted, and the existential undercurrent gives it an additional edge of intrigue.